October 31st (Halloween) is considered the Harvest Day Celebration at American Heritage. Students are invited to attend school in costumes that represent STORYBOOK CHARACTERS OR HEROES, including modern day heroes. No masks or faux weapons are allowed at school. 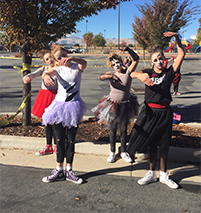 Each year the dance classes work on different sections of the “Thriller” dance. The students come dressed for their performance during the Harvest Day celebration (October 31st). At 1:00 p.m., all the students, staff, parents, and families gather in the parking lot where the dance students perform. Prior to the performance, the parking lot is blocked with caution tape in order to create the “dance” floor and viewing locations. The Christmas Teddy Bear Project has been a part of American Heritage since its first year. Each Christmas, students bring in new teddy bears and place them under the school’s Christmas tree for children in need. On the last day before Christmas break, all of the students form a line throughout the school halls and pass the bears, giving each one a gentle squeeze and a bit of love and hope before passing it along. The school selects a different organization to donate the bears, which has included the Salt Lake Homeless Shelter, the South Jordan Fire and Police Departments for children in crisis, The Bradley Center, refugees, and the Utah National Guard for active military families. Teacher preparation days are scheduled periodically throughout the year. These are days where the school administration and staff hold meetings and prepare curriculum. Early college classes are still held on these days, but no other classes are held. No after-school or extended programs are held on these days. 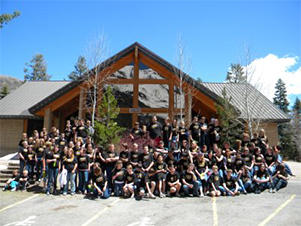 Senior graduation is held each year at Noah’s Reception Center in South Jordan. All students, staff, and families are invited to attend. Graduates receive a senior blanket with the school’s name in recognition of their time and effort spent at American Heritage.